WORKSHOP / $5 / ALL AGES / L.A.'s favourite mid-century oldies sock hop with a queer twist is back in time for us to lindy hop into the homecoming season! 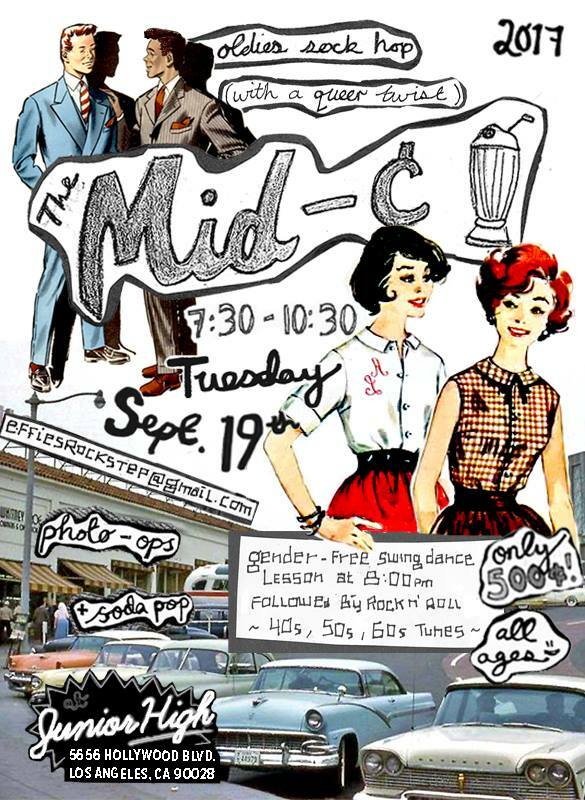 Learn the moves with a gender-free East Coast swing dance lesson led by Effie's Rock-Step at 8:00pm. Anyone can lead and anyone can follow -- anyone can rock n' anyone can roll! No experience needed, and you don't even need to bring a partner. For the rest of the night, the "jukebox" will be playing tunes of the 40s, 50s, and 60s so you can practice your swing dancing- or you can just meet new friends and mash potato the night away! There will be a photobooth and photographer, so wear your vintage threads and let's twist again!